Here is one of those records that falls between the cracks. As it was released in 1979, it gets pegged as a punk single, but it really isn't. There is a bit of a glam sound ala Alice Cooper, but a bit cruder. The guitar has an out-of-this-world sound. It is something that you would find on the Pure Pop blog. And it is really good. I'm not talking about the single's A-side. That is a throw-away cover of Jerry Lee Lewis' "Great Balls of Fire." Nah, the killer here is the flip, "Witch Woman." 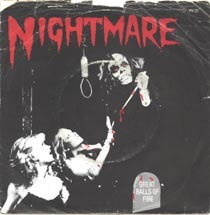 The band Nightmare based its act on horror movies, and they did have an act, complete with props, dancing girls, fake blood and ghouls. This single was originally released in the UK, and reissued across Europe, where they achieved as much success as a band with a minor hit in Italy and Spain does. If you want to read more about Nightmare, the band leader keeps the name alive on this site. hey scott! this is rad. thanks so much for taking the time to post this.